Tour Bahrain International Airport's Terminal Building and learn about its heritage and history. During the tour, you will enjoy an authentic Arabian coffee experience and try out some of our luxurious lounges. You will then go on the Bahrain International Airport Modernisation Program Journey and visit the airside to have a look at the state-of-the-art Ground Service Equipment and the location of the AMP project. This tour starts with a visit to the Al Fateh Grand Mosque, one of the largest mosques in the world. 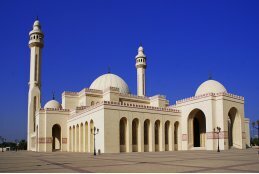 It is named after Ahmed Al Fateh, the conqueror of Bahrain and is blessed with tranquility reserved for the holiest of holy places. Established in 1990, the complex is most famous for its Islamic museum, which has been acknowledged as being one of the most renowned Islamic museums in the world. Our next stop is the Bahrain National Museum built in 1988. This US$ 34 million of ancient archaeological artifacts that cover 6000 years of history. Arguably the most interesting of the exhibits spread between nine halls is a reconstructed ancient burial mound dating to around 2800 BC. The mound was actually uprooted from its original place and carefully reassembled in the museum. For a back to the bazzar street shopping experience head to the Old Manama Souk, a veritable cacophony of sights, sounds, tastes and textures all displayed gloriously and haphazardly along the narrow streets of the old city. Here you can browse for treasures ranging from gold jewellry and gifts to exotic spices. This busy market place includes several traditional and modern shops, stretching from Isa Al Kabeer Avenue on the east-end, Government Avenue on the north and Shaikh Hamad Avenue on the west. Here one gets to see and purchase all possible fabrics, spices, thobes, kaftans, souvenirs, handicrafts, nuts, dry fruits and anything possible. 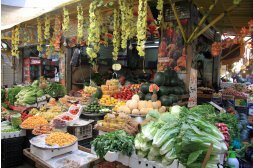 When visiting Manama, a visit to the souq is worth it, if not to enjoy the brightly coloured display of fresh fruit vegetables, and scents of herbs, nuts and spices, but also to observe local Bahrai people going about their daily routines. Nearby is Bahrain Financial Harbour, a world-class, fully integrated development which will create a complete financial city in the centre of Manama. It covers an architecturally stunning stretch of prime waterfront, featuring high-spec office space, luxury residential accommodations and numerous hotel, leisure and entertainment opportunities. Finally, visit the Bahrain World Trade Centre. 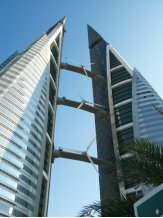 At a height of nearly 800 feet, the two iconic towers offer spectacular views of the Arabian Gulf and Manama cityscape. Voted as the best building for 2008 in the Middle East and North Africa it is a marvel of engineering with part of its energy requirement powered by wind. After pausing to take photographs to enjoy the 30 minutes drive to the wonderful camel farm at Janabiya. Camels are a way of life in Bahrain. These camels are at the camel farm at the village of Al Janabiya is a sight worth seeing to have all 200 plus camels going through their day. There is a special enclosure of baby camels and their beauty takes ones breathe away. You then proceed to the Bahrain Fort. This was the former capital of the Dilmun civilisation; today it is an archaeological site. In 2005 it was a pronounced a UNESCO World Heritage Site. This historic site is the link between ancient and modern. A must see for all visitors to the island of Bahrain. Delegates are required to reserve their place on their chosen tours. Subject to availability. 45 places available for each tour.